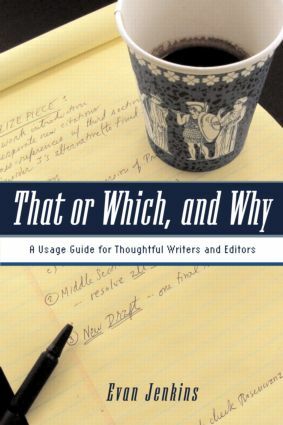 That or Which, and Why is an insightful and witty guide to writing. Based on Evan Jenkins's long-running column 'Language Corner' in Columbia Journalism Review, the book is compiled of brief, alphabetically arranged entries on approximately 200 major writing stumbling blocks, from the wonderful world of 'that' and 'which' to trickier terrain like the correct usage of common idiomatic expressions. Working from his experiences as a newsroom editor and teacher, Jenkins' humorous tone puts the reader at ease, unlike many of the writing and usage guides out there that are off-putting in their rigidity and dogmatism. He takes the 'we're-all-in-this-together' approach to teaching better writing - maintaining a light tone throughout the book and emphasizing flexibility and easy-to-use guidelines rather than delivering orders from Grammar-on-high. A vs. An; A Historic, etc. Five Times Below, 160% Less, etc. Forbid — Make the past tense "forbade."